Спейс-Нидл (англ. Space Needle — «космическая игла») — самая узнаваемая достопримечательность на северо-западе тихоокеанского побережья США и символ города Сиэтл. Башня в футуристичном стиле «гуги» расположена на территории выставочного комплекса Seattle Center, который был построен для Всемирной выставки 1962 года, во время проведения которой примерно 20 тысяч человек в день поднялись на башню; 2,3 миллиона посетителей — всего во время работы Всемирной выставки. Теперь башня находится в частном владении Д. Е. Спейс Нидл — башня 184 метра высотой и 42 метра шириной в самой широкой точке и весом 9 550 тонн. Она построена так, что выдерживает ураганы со скоростью ветра до 320 км/ч и землетрясения до 9,1 балла. Это вдвое выше требований строительных норм на момент постройки. При ветре башня отклоняется примерно на 1 дюйм на каждые 10 миль в час скорости ветра. Оборудована 25 громоотводами. Особенностью башни является обзорная площадка на высоте 159 метров, ресторан SkyCity (Небесный город) и магазин подарков. С вершины башни можно увидеть не только центр Сиэтла, но также Каскадные горы и вулкан Рейнир, залив Элиот и окружающие острова. Подняться от нижней части до смотровой площадки, помимо лифтов, позволяет лестница, состоящая из 848 ступеней. Во время строительства Space Needle было задействовано 467 цементовозов, которые менее чем за 12 часов заполнили котлован основания (30 футов глубиной и 120 футов в поперечнике); это был самый масштабный случай непрерывного бетонирования, когда-либо применявшегося на западе Соединённых Штатов. Very pretty area, lots to do and see in this area. Mopop is just around the corner which is very cool! There is an amazing park for kids and adults to play at also. Additionally, you can take the monorail from pioneer district to it which makes it very convenient for visitors. Finally, beware of the Wyndham sales people inside the armory. There is plenty of decent food there but those folks circle like sharks. Nice view of Seattle downtown and city from their deck. I would suggest either go early in morning and late evening to spend good quality time with your loved ones. Avoid the sunshine on the top. Also take advantage of going there twice because you can use the same ticket twice if you bought the Seattle city pass. You can watch sunset the previous day if you are in town. Good place to be with kids as well. Be careful of the moving and rotating top. 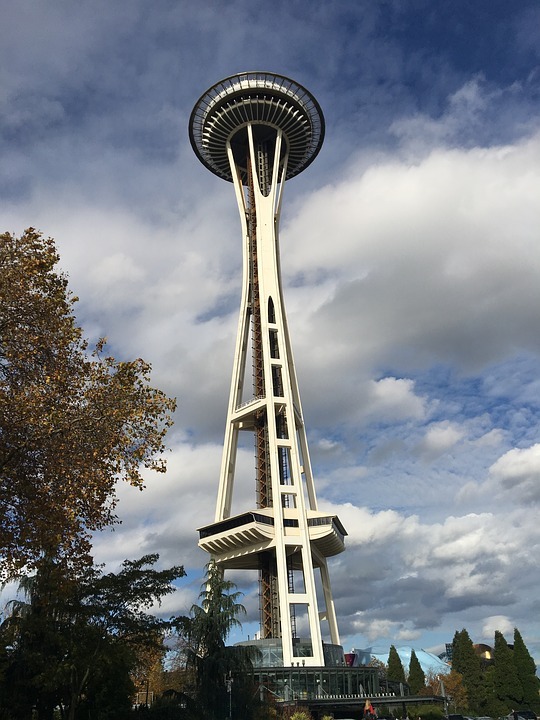 I have been to the space needle three times in the past year and was not excited to go again. However, my niece was in town and had to go. It was an amazing experience this time around. 1) the updates to the space needle are cool. The glass is a great improvement and if you don’t get seasick, the glass rotating floor is also fun. 2) if you haven’t gone for sunset.. do it. It wasn’t a great weather day but the sunset turned out to be incredible. We hung out, got a drink and watched the sun go down and then the city come alive at night. It was wonderful and the only way to experience this Seattle icon. Pre-buy tickets because I’d bet that it sells out many weekends. Plus, then you have a time slot and don’t have to wait. This was a fun and great trip and I highly recommend it. 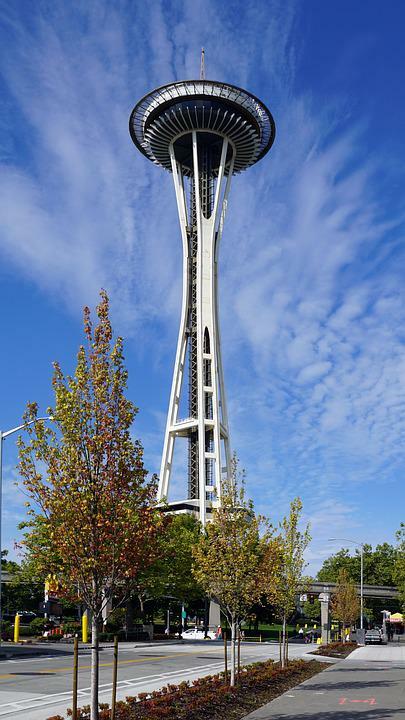 A must see landmark for those living in and visiting Seattle. I took one of the pictures while lying on the green grounds of Seattle center. The top of the Needle has a breathtaking view from all around. The trip to the top is very organized and you can learn the history of the landmark as well as the city while waiting in line. 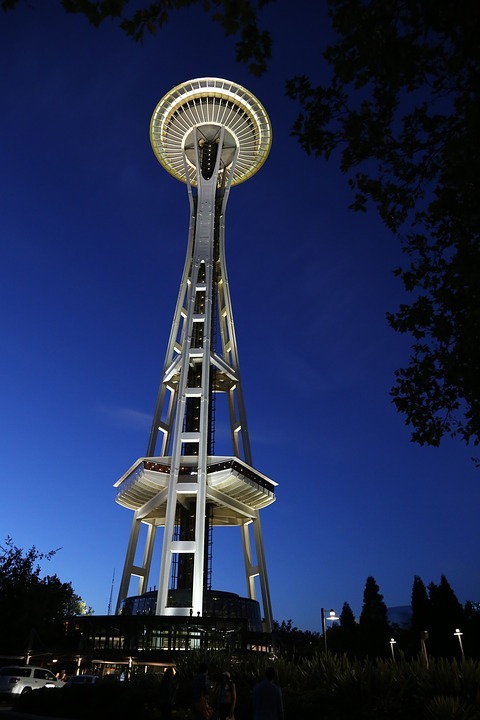 The view of the Space Needle at night is another magnificent feature of the place. I have been up the Space Needle several times but today was the first time up since the renovation. I love it! There are now glass open-air barriers with glass benches that are affixed to the outer Observation Deck. This provides amazing unobstructed views. Unfortunately for us, the skies we're hazy from wildfire smoke so we couldn't see the mountain ranges. There is a higher indoor level that provides great views also. There is a snack bar and tables and chairs. The new revolving glass floor is incredible. It is really neat to be able to look straight down to the ground! I am already planning my next trip up. There is a large gift shop at the base of the needle and a small snack bar up top the needle. The snack bar is way over priced.